Under the auspices of the Student Activities Department, the Petrochemical Engineering Department organized a trip to Fayoum on Saturday 15/4/2017. 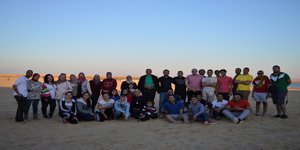 The trip programme started by a visit to Wadi Al-Rayan where the group enjoyed the beauties of nature and took some photos for memory’s sake. During the day, the faculty members and teaching assistants enjoyed playing volleyball, football and sandboarding with the students. Then, they all headed to Mall of Arabia in their way back to Alexandria.